Millimeter Waves Blaze a New Trail for "Safe Mobility"
Smart devices have become more and more commonplace, and at the same time, wireless data transmission technologies have continued to evolve. Most noteworthy may be the millimeter wave technology, which can transmit large volumes of data (wavelength ranging from 10mm to 1mm, frequency from 30GHz to 300GHz). There are hopes that it may be applied to enhance mobility safety. In particular, 60GHz frequency can be commonly used worldwide. There are many potential hazards related to blind spots at intersections. A child may come running out from behind a building chasing after a ball. There may be pedestrians behind tall buildings. And a motorcycle may emerge from the shadows of a truck making a right... Millimeter waves make these blind spots visible and help make roads safer. All that needs to be installed in intersections are a few cameras and roadside units that receive and send images from the camera. These roadside units continue to receive images from the cameras in real time, analyze blind spots for each vehicle, and if they detect objects or motion that is irregular, they immediately send in real time, a "visual image of invisible danger" lurking in blind spots to vehicles approaching the intersection. 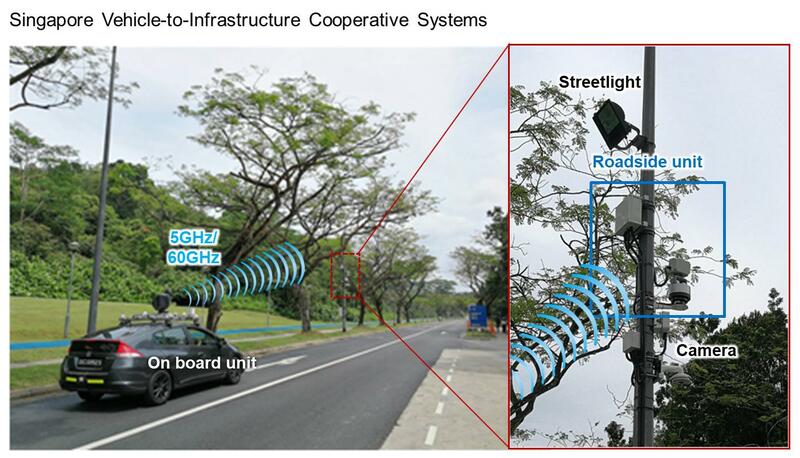 "60GHz millimeter waves technology" makes it possible to transmit data between these cameras, roadside units, and vehicles. AR (Augmented Reality), image recognition, and image synthesis technology is also utilized to visualize and create visual representations for the blind spots for each vehicle. This service will make it possible for drivers to see through obstacles and become aware of pedestrians, children, motorcycles, thereby detect potential dangers and prevent accidents. Situations in intersections change constantly, so huge volumes of image data will be generated, which must be received, processed, and sent rapidly, or spatial data that visualize dangers would not work. Safe and instant transmission of data is made possible by the "60GHz millimeter wave." But of course, there are challenges. If image data transmission to vehicles are interrupted, the system will not be able to inform the driver about dangers in time, which may lead to accidents. To prevent this from happening, realizing rapid, seamless communication with vehicles is essential. To resolve this issue, Panasonic is conducting proof of concept experiments at the testbed of Nanyang Technological University in Singapore. For the experiment, cameras and roadside units have been installed on streetlights. And using a test vehicle, communication with roadside units begins over a hundred meter out, and image data is sent and received repeatedly. 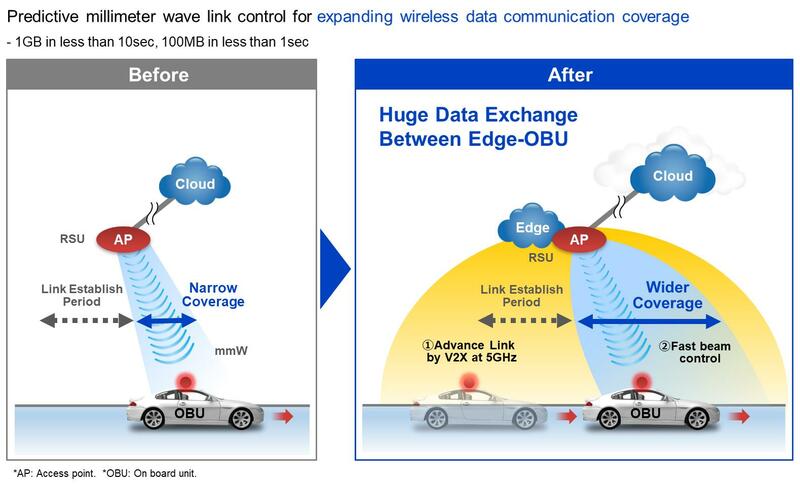 Panasonic's unique technology will use two radios to expand wireless data communication coverage. For areas far away from roadside units, the system establishes a link early using microwaves (5GHz), and as vehicles approach roadside units, it automatically switches to 60GHz high speed transmission to offer continuous coverage with enhanced performance. 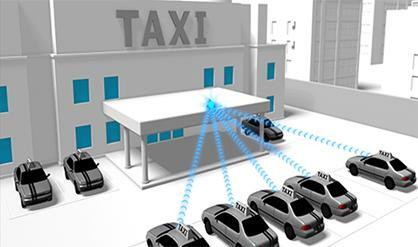 Thanks to this technology, vehicles can stably exchange large volumes of data over a long period of time. Recent experiments have confirmed that 1GB of data can be transmitted under 10 seconds during mobility. This is equivalent to 100MB of data under 1 second. Before: Traditionally, in order to transmit data over long distances, transmission coverage areas had to be narrowed, so not only did it take a while to connect, the connection could only be maintained for a short amount of time. After: By connecting early using microwaves (5GHz), switching could be quickly achieved, and 60GHz millimeter wave communication could be maintained for longer periods of time. 60GHz millimeter waves can do more than merely make blind spots visible. 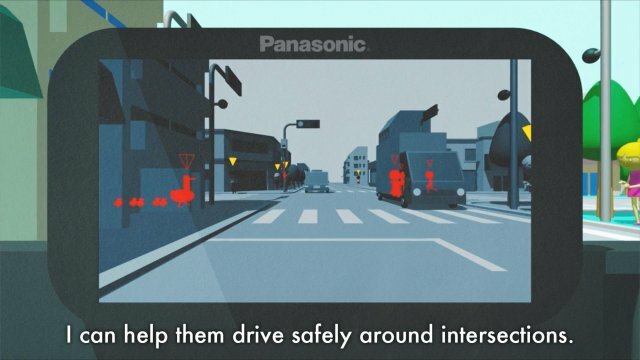 Panasonic believes that it can be applied to enhance safety of mobility. Below are some examples. Using 60GHz millimeter wave, super high speed transmission, vehicles can download up-to-date map information to its navigation system, for example, to update about recent local abnormal road conditions and activities, which may be provided in 3D high definition. Moreover, a vehicle passing an accident can send images to cars following suit, and also instantly update navigation information. Image data from cameras and drive recorders on buses and taxis in the depot can be rapidly gathered to check on how they operated and the condition of the drivers to help enhance safety, or to check on the customers to help improve service. Furthermore, image data of the exterior of the fleet can help prevent and detect crime and disasters. Shortage of drivers is becoming a growing problem. This technology can help alleviate this issue by enabling truck platooning with a single driver. 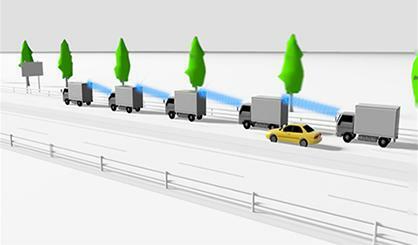 Real time footage of inter-vehicular distance and peripheral areas can help detect dangers when changing lanes and provide essential information for safe platooning. Panasonic is also developing and applying research to various wireless communication technologies using frequencies other than 60GHz, in preparation for the arrival of 5th generation mobile communication (5G).The development of various sensing technologies applying wireless technology and image processing technology is also underway. The goal is to link sensors in order to visualize objects that could not previously be seen. In order to contribute to safety and comfort in a future mobility society, Panasonic will continue to conduct advanced research and development on wireless and other technologies.